Beautiful & Affordable Apps Designed for Small Businesses. Focused on Small Business designs! Have a Smartphone? Your customers do! 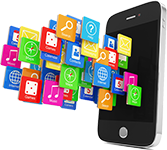 We will build you a beautifully designed Mobile App, publish it to the leading app stores and maintain your content using the latest technology. Engage your customers, increase loyalty and grow your business. Your Business deserves a Mobile App. 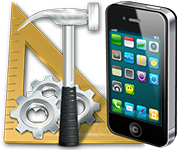 Small Businesses are creating Mobile Apps at an unprecedented pace. Are you interested in increasing sales? Do you want to reduce your marketing costs? Would you like an easy, effective, and inexpensive method for engaging with current, past, and future customers? Take a look at the stats…. – Over 50% of internet usage now takes place on mobile devices – not computers. 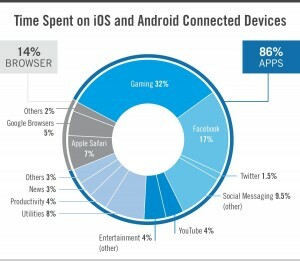 – Smartphone owners spend 90% of their online time on mobile apps, rather than on browsers. – 79% of smartphone owners use apps every day. – Smartphone users spend 5 hours on their mobile devices per day*, mostly on apps. It boosts interest & sales. When you develop an App, it gives you an easy way to showcase your business. It provides a direct marketing channel. Apps serve many functions: they can provide general info, prices, booking & order forms, search features, user accounts, messengers, news feeds, and much more. It enhances engagement. Most shoppers cannot resist the temptation of a good deal or great discount. You can share specials and events, create loyalty, and increase sales, as often as you’d like without incurring any cost. Stand out from the competition. Large companies have already developed their apps. Small to medium size businesses are creating their own apps at an increasingly rapid pace. A first-mover advantage is critical. Own a Beautiful Mobile App Your Peers Envy, and Your Competitors Want to Copy! We design, publish and maintain your app on the leading platforms: iOS and Android. For premium features, we will give you access and train you on how to manage them. Simply Beautiful! We’ll use your logo and other business elements to design all the necessary graphical content needed for your mobile app. Enjoy Your New Mobile App! Rewarding features! We publish your newly designed mobile app to the world! You now own a smartphone application that you can be proud of. We’re Innovative – lots of features. Link to your website’s home page or specific pages, such as your menu. Get feedback from your customers with a customized feedback form within your app with results emailed directly to you. Show the current weather and forecast at your location. Show your business location on a map with the option for directions via Google Maps integration. Your customers can contact you by phone or email directly from your app. Show your YouTube or Vimeo video channel right within your app. Display images of your business in a gallery in the app. Or, link to your social media image feed. 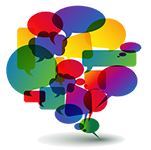 Send messages to your customers to inform them about upcoming specials and events. Send immediately or schedule for specific dates and times. Include a tip calculator inside your app to help customers quickly calculate a tip amount for one or any number of people to split. Create your own customized digital loyalty cards and passwords for individual employees to apply points. Customized surveys with results sent instantly to you by email. Options include radio buttons, check boxes, text fields for detailed responses, option to contact the customer and logic triggers based on answers to survey questions. Keep your customers up to date on your latest news and events with your own news wall. List jobs available in your business and allow candidates to respond and apply within your app.